Budget Day gave New Zealanders a chance to see how well the National government has been doing in keeping the country’s finances in order. Before examining the budget, we should remind ourselves that in 2009, not long after National was first elected, then Secretary of the Treasury John Whitehead revealed that up to 60 percent of all government spending was considered to be of ‘poor’ quality – “including spending on policies introduced 15 years ago, that may no longer be as effective or fit Government objectives”. By cracking down on this massive level of government waste and reducing spending, an opportunity existed to transform New Zealand into a powerhouse economy like Hong Kong, where government spending is capped at 20 percent of GDP, and Singapore, where the government spends around 19 percent of GDP. Less government spending, of course, means lower taxes – in Hong Kong the top income tax rate is 15 percent and company tax 16.5 percent, while in Singapore the top tax rate is 20 percent and the corporate rate 17 percent. These low tax rates are key drivers of economic growth. “Judged in conventional terms, the National-led Government’s sixth Budget looks pretty good. As promised, the Minister of Finance can point to a small surplus in the Underlying Operating Balance (before gain and losses) in the financial year starting on 1 July and increasing surpluses in future financial years. Given the huge deficits which were projected when National first came to office in 2008, and the huge fiscal cost of the Christchurch earthquakes, that’s a good achievement, and it’s been done largely by keeping a pretty tight hold on government spending as the economy has recovered. As a result, core Crown expenditure, which was around 35 percent of GDP as recently as 2010/11, is projected to be 31 percent this year and below 30 percent by 2016/17. Dr Brash believes that on balance, the Budget will have improved National’s chances of winning the next election, but he does have reservations – you can read his full guest article HERE. Credit rating agency, Standard & Poor’s gave the budget the thumbs up, reaffirming their AA+ rating on New Zealand government debt. The Minister of Finance Bill English is clearly both determined and ambitious about National’s long term debt and spending reduction plans. He would like to see government debt reduced down to 10 to 20 percent of GDP by 2020 – at which time contributions to the New Zealand Superannuation fund would be resumed – and government spending lowered to 25 percent of GDP in six or seven years time. Spending at such a level would be an historic achievement. Mr English is very mindful of how government spending affects mortgage interest rates and he does not want a repeat of the situation that existed under Helen Clark’s Labour administration, where excessive spending helped to push interest rates over 10 percent. The advice from Treasury is that government spending of around NZ$1.5 billion a year is the upper limit before interest rates – and the exchange rate – are materially affected. National has certainly delivered on this objective during their six years in office. Much to the frustration of many New Zealanders wanting to see a greater emphasis on economic reform, National navigated through the domestic recession, the Global Financial Crisis and the Christchurch earthquakes with a slow and steady hand, taking on extra debt to in order to stick to their promise of protecting vulnerable families during difficult times. The political importance of this economic discipline should not be underestimated, and nor should the importance of keeping election promises. Once a government reneges on major promises, it loses the trust of voters, and the backlash is felt at the ballot box. That’s one of the main reasons why opponents of John Key’s government use opportunities like the budget debate to harangue the Prime Minister about his 2008 promise to not lift the pension age. They know that if they can goad him into agreeing that super is unaffordable, public trust would be destroyed, and a fatal blow would be dealt to his administration. In other words, for them, politics is the name of the game, not the age of retirement at all. Public policy spending decisions are, of course, a matter of political choice for any government. John Key’s promise to leave the retirement age at 65, protects the long-standing compact that exists between government and the people: if you work hard for 40 years and pay your taxes, the government will look after you with a pension when you reach the age of 65. While people are certainly living longer these days than they used to, that doesn’t change the fact that for many workers, physical capacity starts to decline in their sixties. Leaving them with some quality time to achieve some of their other life goals has always been considered fair and reasonable. Given this is shaping up to become a major political football in this year’s election campaign, let’s remind ourselves of the numbers. According to Treasury, around 640,000 New Zealanders will receive a pension by the end of this financial year at a cost of $10.9 billion, or 4.8 percent of GDP. By 2060, the number of pensioners is expected to reach 1.5 million, and the cost of super is expected to rise to 6.6 percent of GDP. This figure is at the lower end of the international scale of public expenditure on pensions. While there is clearly much more to this issue – and we will save it for another day – it is important to recognise the political motives that are at play in this debate. Political motives also underpin the whole question of child poverty – another issue raised in the budget debate. The fact is that when political advocates define child poverty as being based on “60 percent of median disposable household income, after adjustments for housing costs”, child poverty can never be reduced. No matter how high wages rise, there will always be the same number of families receiving less than 60 percent of median disposable household income, after adjusting for housing costs. That’s why the politicisation of the poverty debate by the office of the Children’s Commissioner is so regrettable – New Zealanders should expect better from the country’s leading publicly funded child advocate. It’s a valid question – just how much more do Labour and the Greens want to squeeze Kiwis who are trying to build a good life for themselves and their families? And how can they possibly imagine that imposing a raft of new punitive taxes is a fair or good way of encouraging New Zealanders to work harder and become more productive? We should keep in mind that as far as tax is concerned, lower and flatter taxes are a better and fairer way of encouraging hard work and enterprise – as Hong Kong, Singapore, and many other successful countries show only too clearly. A low flat tax is actually the answer for New Zealand too – we just need political leaders to recognise it! So what did the budget show? Firstly, that the economy grew 3.1 percent in 2013, the fifth-highest rate in the OECD. Real GDP growth is expected to peak at 4 percent next year driven by low interest rates, elevated terms of trade, a catch-up in housing supply, the Christchurch rebuild, strong consumer and business confidence, new investment, and higher productivity. Stronger growth is delivering more jobs – compared to December 2013, forecasts show an additional 170,000 people are expected to be in work by mid-2018, when the unemployment rate is expected to fall to 4.4 per cent. Wages are rising faster than inflation, with the average full-time wage forecast to rise to almost $62,300 by 2018 – an increase of $7,600 over the rate in December 2013. The big surprise in the budget was the introduction of $500 million in family-friendly programmes, namely free doctors’ visits and prescriptions for children under 13, an extension of paid parental leave, and a boost in parental tax credits. In addition, there was a wide range of new spending for early childhood centres, social housing, cancer treatment, home-based care, new apprenticeships, welfare reform, research and development, motorway building – along with initiatives to lower the cost of building a new home, and reduce ACC levies… full details can be seen in the budget documents HERE. Those documents also show just how much National’s slow reduction in government spending has cost the country. Last year, borrowings of $110 million a week were needed to meet spending commitments – including the $1 million an hour necessary to maintain social safety net entitlements. This year, borrowings will fall to $75 million a week, but as Finance Minister Bill English explained, “Paying the interest on our debt this year will cost $3.6 billion – more than we will spend on the police and early childhood education combined”. That’s why, looking forward, the long term economic health of New Zealand can only be assured if there are further reductions in government spending to balance the budget – rather than the reckless tax-and-spend approach that proved to be so disastrous under Labour. And, finally, to put all of this into perspective, here is what Cicero said – in 55BC: The Budget should be balanced, the Treasury should be refilled, public debt should be reduced, the arrogance of officialdom should be tempered and controlled, and the assistance to foreign lands should be curtailed, lest Rome will become bankrupt. People must again learn to work instead of living on public assistance. 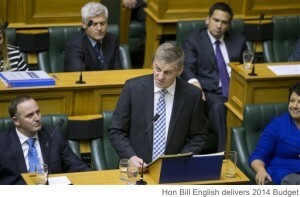 Do you believe that the budget was positive or negative for New Zealand?